Most schools spend a lot of money in January on buying stationary for the term or year. Ncinci One's Montessori was so blessed, as we did not need to buy any stationary at all and this is with great thanks to Orby Nicolls, who started the first Ncinci One's pre-school at Hole in the Wall. His huge donation of stationary last year will last Ncinci One's for a year or 2 - thank you for the wonderful donation Orby! Tamzyn (my niece) came to visit in January and her and the children went on quite a few litter missions. They took all the 2l Twizza bottles from the garbage and washed them. The bottles were cut in half and lines were drawn for where the children should cut (the petals). The children then painted the 'flower' bottles and they were attached to the stalks painted on the wall. What a lovely result! Thank you to Tamzyn for sharing your recycling knowledge with us. With thanks to the Wildcoast Forum, I was lucky enough to attend the 5-day Thanda Afterschool Creative Learning Curriculum training which was held at Mdumbi Backpackers in early February. 12 people from the greater area attended the training and it was kindly sponsored by the DG Murray Trust. It was absolutely great and soooo useful! I love their holistic approach to children and the way they use stories as themes. 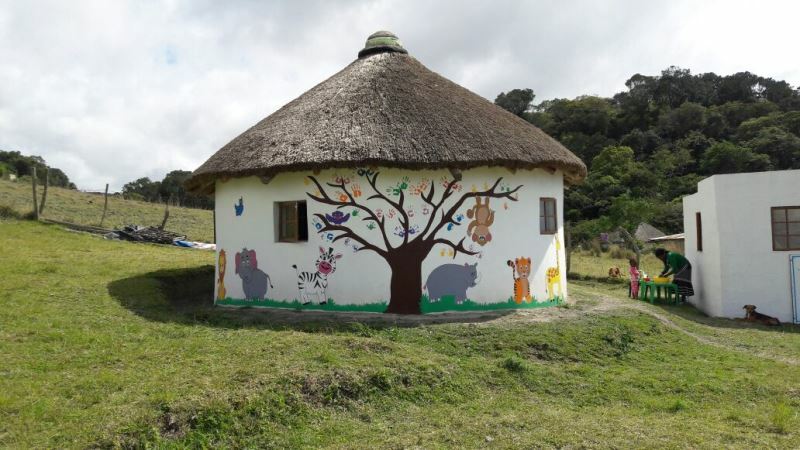 They currently provide Afterschool Creative Learning to 700 students in rural Kwazulu Natal. I definitely want to implement this as a new project before 2018 as this will also ensure that the Montessori children who go onto the local JS schools still have the opportunity to continue speaking and learning English and a whole lot more! English is only taught from about Grade 4 in our areas. Thank you very much to Thanda training (Tyler and Angela) for sharing your knowledge and resources with us - we really appreciate it! February also saw a change in teacher Assistants at Ncinci One’s Montessori. We are very pleased to welcome Nosandise Bhaziya to the school, and she is very keen for Montessori training. There are currently 24 children on the waiting list for Ncinci One’s Montessori, so we really need to build another rondawel. We are in discussion with the mamas of the children on the waiting list, as they are looking at making mud blocks in May, once the rain has stopped. We will then need to fundraise for plaster, paint, roof, furniture and learning materials. We currently have R7500 in our ‘new rondawel’ kitty. We would like to say a special thank you to the Lunchbox Fund, who assists us with lunch nutrition at the school. Their boxes always arrive in good time and the children enjoy the products a lot. Thank you very much for your support. Stay well and we look forward to hearing from you.